Recently the stars have aligned and God has been throwing lesson after lesson at me like pow, pow, pow! And I am inspired. So here. I wanted to share this little nugget with you all today. YOU owe it to yourself to stop holding yourself back. Listen. You have the power to live the life you truly want. We talk about this all the time and I’m sure you heard it a gazillion times too. But the awesome thing is that it’s true. But there is only one thing that holds people back, and it’s themselves. And yes, this may have something to do with the doubt you may have or even the hardships of trying to break out of societal standards. Indeed this is all true. BUT to be honest with you (and myself) is that most people are not accomplishing their dreams because they are simply not putting in the work. You’re either waiting on the right time, which is never to be frank. Or you just don’t want it bad enough. A lot of people are all talk. They have dreams as big as the world, but their effort is as small as a seed. Are you doing something everyday that is contributing to your dreams? Are you truly getting aft’ it? This is the time to be brutally honest with yourself. Because if the answer is no to any of these questions, you my friend, are holding yourself back. And you deserve better. Now let’s get to it. Make time. Background: I don’t know what it’s going to take for you to get on it, but the reason I wrote this post was because I know I have not been putting in the work I need to in order to be who I know I should be. What inspired me is actually seeing the grind of a friend. His ambition is on 1000% and he is so close to being where he wants to be. And now I know, that it takes more than what I’ve been giving to accomplish my dreams. Sure some things may come to you, but you are kidding yourself if you think you’re not gonna have to put in work. You owe it to yourself. It’s grind time. And now I’m working as hard as ever to become “who I wish I is”. And if you read my last post about being “Recently Single & Dating Again” you know I just got out of a 6 year relationship with my first love. And when I say, it was only my intuition that drove me to the break up, it was just that. It’s that feeling when you know “something’s just not right.” And boy I tried so hard to fight the feeling and justify the reasons why I should stay. But to be honest my intuition wouldn’t let me. I was always stressed out and my heart was so heavy. So you see. These are the signs. You know them. They’re there. And you may, (like I did), try to fight it but you have to listen to it or else you risk just settling. Always feeling somewhere deep inside that you deserve better. That you deserve more. And reality is, if you’re feeling this way, you do. I’ll leave you with this. God wants you to live life and live it more abundantly. So all of this settling, mediocre stuff is for the birds. We are beautifully and wonderfully made and we are meant to live a beautiful life. We have this slogan called “Adventures of Lifetime” for every trip we take. The first “adventures of a lifetime” started in San Marcos where our girl Deborah (Creator of Redefining Beauty) lives. But this past May we took it a step further and went out of the state to Los Angeles and it was phenomenal! Here’s a recap. Here are some tips to a successful vacation with friends. Go with the right people. We all have friends, but that doesn’t mean we have to travel with all of them. Luckily the ladies of InspireFire and Redefining Beauty are besties and awesome travel partners. We just fit. We love the same things: working out, nature, shopping and healthy food. You should go with someone with similar interest and plan activities related to it. Location is key. Pick a location where stuff is (for a lack of better words) popping! We got an Airbnb smack dab in the middle of WeHo (that’s west hollywood). We were walking distance from shops on Melrose and cute restaurants. Oh, and there was a Whole Foods literally down the street! A dream!!! Plan ahead. When there’s four people you need to have a plan of action to make sure you’re never sitting around asking what’s next. That’s why we made an itinerary breaking down each day, down to the restaurants. And no, we didn’t stick to the itinerary completely, but we were never bored. So start doing your research and plan your trip out. You won’t regret it. Know the infrastructure of the city you’re visiting. When planning this trip we asked for a lot of advice. We got the warning signs about the traffic in LA so that’s why we picked a walkable location. But we still knew there were places we could only go in a car (due to lack of sufficient public transportation), so we rented one. Know the city infrastructure so you know your needs. Go with the flow. Sometimes things just go wrong or don’t go as planned. But all you can really do is go with the flow. Don’t get stressed out about things you can’t control. For goodness sakes, you’re on vacation. Relax and really enjoy the people you are with. Have fun! Go crazy and live it up. You deserve it. 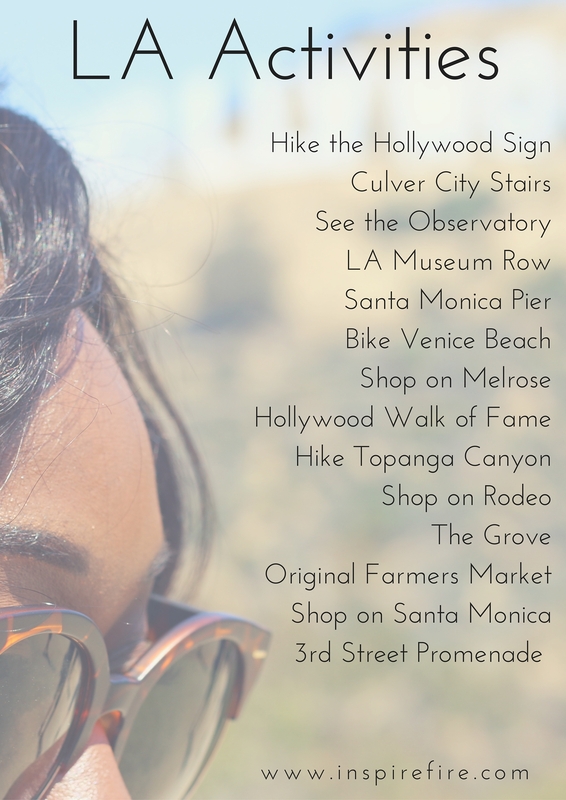 Check out our LA activity list! Wanna know where we ate? We got you. Best Health Conscious Restaurants in LA you just HAVE to go to! Research shows it takes 10 positive comments to offset just one. Have ever heard comments like this? How did they make you feel? Now think. What are you saying to others that may be affecting them? Is it uplifting or is it subconsciously tearing them down? We all are already hard enough on ourselves and those extra little comments can easily send someone down a negative spiral. When some says “You look so pretty today,” you start to feel pretty and then you start to exude confidence. Really THINK before you speak. Is what you’re saying . . . True: Is it true or is it a reflection of your own perception? Helpful: Is it beneficial, valuable, informative or useful? Inspiring: Is it uplifting the person to be the best version of themselves. Necessary: Is it really that important? Is it the right time to state your thoughts? Kind: Are you being considerate of their emotions? Is your comment coming from a good place? Just be mindful about the remarks you make. 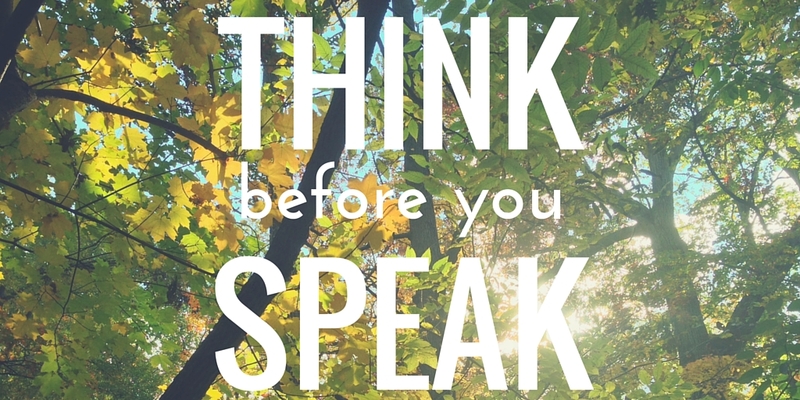 Many times we are so quick to make little comments without thinking, that may take a major toll on someone’s insecurities. We have so many thoughts a day, and for many people a multitude of those thoughts are negative. How many times have you heard someone say “I AM broke”, “I AM just trying to make it” or “I AM tired? Do you understand what’s being done when saying this phrase? Evaluate the outcome of the people that are using those phrases and see how it’s reflecting in their lives. When people are saying those negative phrases they are unknowingly programming these things into their lives. Though one may not believe the things they are affirming, it is essential to practice using I AM the correct way. Once upon a time we didn’t know how to tie our shoes, ride a bike, or simply how to write our ABC’s, but with practice we can now do these things with ease. Let’s get the the basics! Step One: Get a journal, chalkboard/poster board or simply anything you can write your affirmations on where you can easily view them. Step Two: Consistently say your affirmations. Start by looking yourself in the mirror and saying them to yourself. Step Three: Put the icing on the cake by feeling that you are already there. Use your 5 senses to exist in the state that you are manifesting. If you want to vacation more, literally see yourself walking on the beach feeling the gritty warm sand kissed by the sun slipping in between your toes, taste that succulent juicy pineapple chunks on the tip of your tongue, hear the waves crashing into each other and smell nature’s sweet salt water gently tingling your nose. I AM feeling GREAT right now!!! I AM a joy to be around. I AM overly financially comfortable. The first time God ever addressed himself in the Bible was when he used the words I AM. So think about it, every time you use the words I AM it’s like putting God’s blessing on it. Whatever you put after the words I AM is a form of prayer. He gives us power and authority. Don’t waste that power. Jump start your life! 30 Days to the life you want. How you can HAVE, BE & DO ANYTHING YOU WANT! 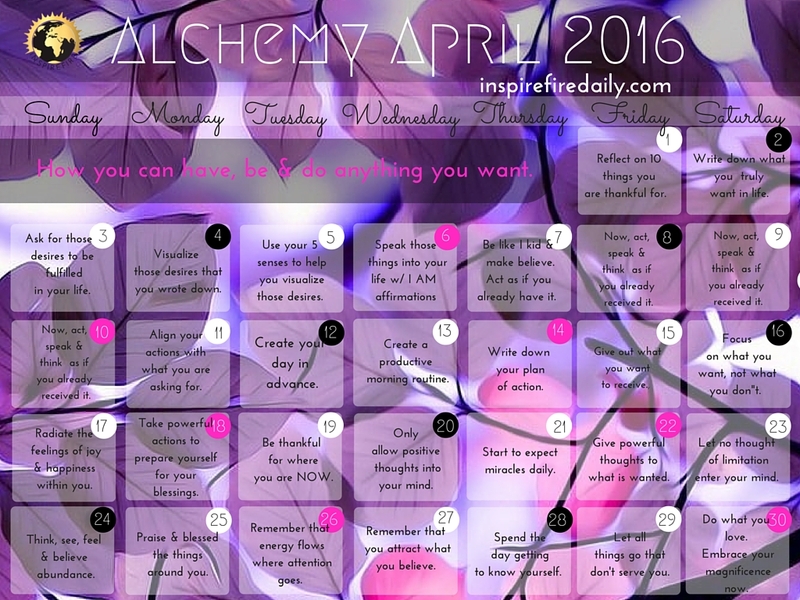 It’s Alchemy April! Make sure to follow this guide and focus on the daily task! 30 Days to greatness! Here we go! Ask, Believe, Receive: The creative process of how to get what you desire. Your wish is your command. The Power of Gratefulness: Be grateful for what you have NOW and you will get an AMPLIFIED multitude of blessings. When you’re thankful, life will give you more moments to be thankful for. The Power of Visualization: The mind can not decipher between reality and imagination. By literally visualizing a detailed description of what it is that you want you are attracting those circumstances into your life at a higher frequency. The Power of Pen & Paper: Writing down your dreams/goals/plan is the highest form of imprinting those very things into your subconscious mind. Thus, making it easier to put forth actions to manifest your desires. The Power of Thoughts: You become what you think about most of the time. So choose your thoughts wisely. Where you are NOW is the product of your past thoughts. What are you thinking now that is cultivating an amazing YOU! The Power of Energy: Everything is energy and YOU ARE AN ENERGY MAGNET! Wherever you put energy is what will flourish. The Power of Actions: Your actions must align with your goals. Are you taking actions that are contributing to your dreams? The Power of the Tongue: The Bible says the power of life & death is in the the tongue. So you must ONLY speak good things into your life. Because what you say is nurturing a seed that can become reality. The Power of Feeling: Feeling is the most powerful frequency into your life. Regardless of what you think, write or say, the feeling that you are emitting is the same feeling you are more likely to receive. The Power of Giving & Receiving: Give and it will come back to you. Are you giving , time, peace, love, happiness and money? Whatever you put out comes back to you. We must also be open to receiving. Often times when we are offered something we truly want, we turn it down out of “etiquette”, but in actuality we are blocking our blessings. The very blessing that you already gave out. I am receiving (fill in your desire) now!!! Step One: Acknowledge the habit you are in the process of overcoming. Physically writing down the old habit in a journal or notebook. Example: If I no longer “insert habit” i will have more time to spend with loved ones. If I no longer “” I will have more time to be productive. If I no longer “insert habit” I would be more confident. “I am so glad I am at my goal weight! Step Four: Eliminate the words “try” “can’t” “need” “I will” “I want” and “I’m going to” from your vocabulary completely. By using phrases such as these, you are actually sending a sense mediocrity into the universe. And we all know whatever you send out into the universe you will attract. Step Five: Transition your thought process away from doubting, hoping and wishing and turn that into absolutely KNOWING! The mind cannot depict the difference between imagination and reality. That’s why it is so important to take at least 5 to 30 minutes daily visualize yourself as if you have already achieved your new positive habits. Step Seven: Surround yourself with people who are rooting for you. Step Eight: ALWAYS celebrate yourself, every milestone is important! Keep in mind there’s no right or wrong ways, you create the rule. We unknowingly slip into a negative train of thought when dealing with everyday situations. From the car you drive to the house you live in to the the food you eat, it all manifested from a thought. So what kind of thoughts are you calling into your life? Do you consistently feel down? Are you unsure of yourself? If so, this may be an effect of negative thinking. But luckily, for you there are three simple ways to turn those negative thoughts into positive and those positive thoughts into a life of fulfillment. Never let your past affect your present. If you’re constantly focused on the past whether it’s good or bad, you’re never be in the present. You’ll never get to experience the LIFE that’s right in front of you. Build from your past, but don’t dwell in the pain or the glory. Learn from the challenges and make new moments of magic. You feel me? 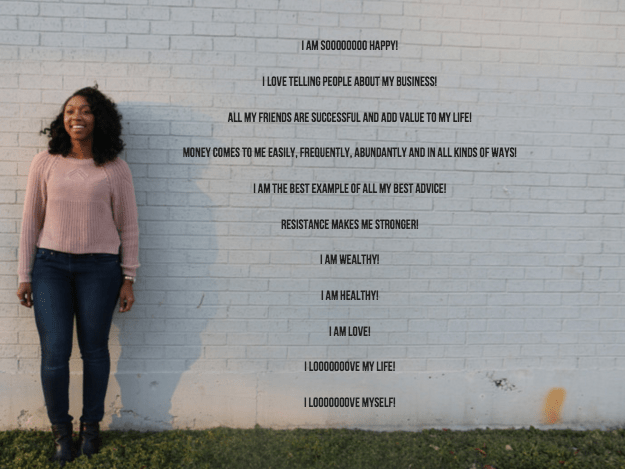 What is an affirmation? Anything you say or think (consciously or subconsciously) that is used to create or eliminate something in your life. Proverbs 18:21 The power of life and death is in the tongue. What is the 24 Second Rule? Do not allow yourself to go twenty-four SECONDS (YES 24 SECONDS) without controlling your thoughts. Constantly govern your thoughts. It is so easy to allow our thoughts to get the best of us, but not anymore. From this moment forth DAILY, HOURLY, MINUTELY, AND EVEN SECONDLY consciously control what you allow your mind to think. The second you have a negative thought cross your mind, imagine a huge orange bat hitting that thought away and quickly replace it with a thought that serves you. To take it a step further, actually imagine them calling you into the office, shaking your hand, congratulating you and saying ‘you’ve got the job’. Quote From InspireFire Book Club The Secret: Thank God there’s a time delay, that all of your thoughts don’t come true instantly. We’d be in trouble if they did. The element of time delay serves you. It allows you to reassess, to think about what you want, and to make a new choice. By functioning in that thought pattern, in actuality you are engaging the feeling of lack. Which causes you to manifest all of the things you “do not” want! Luckily your mind can not think two different thoughts at the same time. So when you find yourself thinking thoughts that subtract value from your life, literally catch that thought in transcendental space, stop thinking it and then replace that negative thought with thoughts that add value to your life. Keep in mind this is not an overnight process. Many of our negative subconscious thoughts have been programmed since youth. Therefore we must slowly replace negative thinking with a fresh positive outlook. We must re-educate our minds to know that you have everything you need for complete peace and total happiness RIGHT NOW! The sooner we stop putting happiness into the future by saying… “I WILL” the sooner we will gain happiness in the present.. Instead say/think… “I AM” happy RIGHT NOW because I KNOW I’m getting that promotion. Do not say “I WILL” be happy when I lose 15 lb. Instead say… ‘I AM” looking great and feeling more slim than ever. You should always speak the goal that you are in the process of achieving as if you’ve already achieve that goal. When you do this, the universe has no choice but to respond to what you are focusing on. Learn more about the Power of I AM here.